Argentina has made a lot of progress since the economic crisis of 2001-2002. However, it still faces considerable challenges as a result of income and regional poverty. 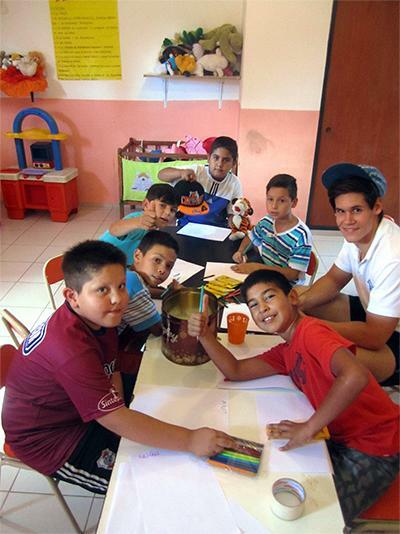 Projects Abroad works with a number of disadvantaged communities in Argentina, which suffer from problems such as lack of education, marginalization, drug use, and a general lack of support to children. As a volunteer, you can help provide the individual support and attention that every child needs, but which the local staff are too busy to provide. You will have an important role to play at the Care Project, whether you are volunteering during a gap year, summer vacation, career break, or if you are retired and want others to benefit from your experience. All we ask is that you have energy, enthusiasm, and a commitment to the work! Our local staff will provide you with support throughout your project. We are partnered with a number of kindergartens, community centres, and dining halls in Argentina, most of which are based in the city of Cordoba. We also offer placements in the surrounding areas of La Calera and Villa Allende. No matter where you are placed, you will be able to make a significant impact on the children there. There are opportunities to volunteer at special needs centres in Argentina. You will work with children and adults with mental and physical disabilities, helping with daily care, exercises, and basic education, as well as offering your friendship and support. If you would like to participate in this option, please let us know when you apply. If you are interested in working with children and animals, we also have Equine Therapy available in Argentina. Helping out with daily tasks at the placements, like making sure that the children eat their meals. We also work in community dining halls where children from underprivileged areas are fed and sheltered. Here you can help with feeding the children, assisting them with their homework, providing individual attention, and organizing fun activities for everyone. During your time at the Care Project in Argentina, our staff will organize weekly meetings and bi-weekly workshops for all volunteers to attend. This is a wonderful opportunity to learn new games and activities that you can use at your placement, and to share any ideas you have with the other volunteers. The Projects Abroad office also has resources available for you to use, such as games, paper, paint, arts and crafts, and more. Whatever skills and talents you have, volunteer work with children in Argentina will give you the opportunity to put them to good use. You could teach the children to dance, draw, or play soccer. You could even arrange to take the children on a day trip if you have permission from the placement and Projects Abroad staff. The more time and effort you put in, the more rewarding your placement will be both for the children you are working with and for you yourself. The General Care Project in Argentina is available from one week if you do not have time to join us for four weeks or more. This project has been selected by our local colleagues as being suitable for shorter durations for both the host community and the volunteer. Although you will gain valuable cultural insight and work intensely within the local community please be aware that you may not be able to make the same impact as someone participating for a longer period. If you are a high school student and first-time traveller you may want to consider our High School Special programs in Argentina.